The aim of this study was to assess safety measures in hemodialysis (HD) units in Dakhlia governorate. Healthcare-associated infections lead to death, disability, and excess medical costs. Infection is considered the second cause of death in patients with end-stage renal disease after cardiovascular disease, and septicemia accounts for more than 75% of these infection-related deaths. Annual death rates due to pneumonia and sepsis are markedly higher in dialysis patients compared with the general population. We obtained this questionnaire from the Ministry of Health and Population. It was designed to assess infection control measures in HD units, which is one of the most important areas of safety risk in dialysis facilities. A survey was performed on 18 units in Dakhlia governorate. The questionnaire is divided into sections as follows: general information about the unit, cleanliness of the place, hand washing, personal protection, methods for preventing pollution, dealing with furniture and sheets, environment cleansing, dealing with waste products, occupational health, isolation, and records. In our study we found (generally) that most of the dialysis units are in a large percent clean in general. The medical team does not commit enough to wash hands despite the availability of disinfectants. Moreover, there is no commitment with regard to the use of personal protective equipments. The studied units showed satisfactory percentage for all points as regards methods for preventing pollution, except commitment of the medical team to a septic nontouch technique. All studied units showed very good results in all items as regards environmental cleansing, but there was a clear error in separation between storage areas and the patient treatment area and in dealing with blood stains. We found that all studied units were ideal in dealing with furniture and sheets and recording data, but there were a lot of mistakes in dealing with waste products. The results of this study indicate a significant correlation between the number of staff and implementation of infection control measures and decreasing mortality and morbidity in patients undergoing HD, as infection control is considered one of the most important aspects of safety that improves the quality of life of these patients. Healthy kidneys clean blood by removing excess fluid, minerals, and wastes. They also produce hormones that keep bones strong and blood healthy. When kidneys fail, harmful wastes build up in body, blood pressure may rise, and body may retain excess fluid and not make enough red blood cells. When this happens, we need treatment to replace the work of the failed kidneys . Loss of kidney function leads to uremic syndrome, a complex phenomenon involving dysfunction of many organ systems in the body. Uremic syndrome is attributable to the retention of numerous solutes normally excreted by healthy kidneys. However, many of these abnormalities can be improved with hemodialysis (HD) therapy . HD is the most well-established form of treatment for end-stage renal failure. Enormous technological advances have been made since the introduction of this form of treatment over 30 years ago . HD usually takes place three times a week, each session lasting between 3 and 6 h depending on the size of the patient and their compliance with dietary restriction. A few patients with residual renal function can be managed successfully with twice weekly dialysis, but this is not a satisfactory regimen for the majority of patients. Patients undergoing HD are at risk for bloodstream infections, and preventing these infections in this high-risk population is a national priority . In an environment where multiple patients receive dialysis concurrently, repeated opportunities exist for person-to-person transmission of infectious agents, directly or indirectly through contaminated devices, equipment and supplies, environmental surfaces, or hands of personnel . Infection-related complications of HD include bacterial infections caused by contaminated water or equipment, other bacterial infections (including vascular access infections), and blood borne viruses [primarily the hepatitis B virus (HBV) and hepatitis C virus] . Standard precautions with additional measures recommended specifically for dialysis centers will prevent transmission of bacteria and viruses from patient to patient . These precautions include routine use of gloves, hand washing, and cleaning and disinfection of the external surface of the dialysis machine and other environmental surfaces. In addition, preventing transmission of HBV infection requires vaccination of susceptible patients and staff, avoiding dialyzer reuse, and use of dedicated room, dialysis machine, and staff members when treating patients chronically infected with the virus . Safety questionnaire can be administered to patients and staff and the responses evaluated to improve understanding of the prevailing attitudes and concerns about safety. By sharing these results, openly acknowledging the challenges, and using a blame-free root cause process to identify action plans, the facility can begin to establish a culture of safety . The study was approved the ethical committee of the hospital faculty of medicine menoufia university and the patients gave an informed consent. This study was conducted on 18 units of HD in Dakhlia governorate, Egypt. We obtained this questionnaire from the Ministry of Health and Population. This questionnaire was designed to assess infection control measures in HD units, which is considered as one of the most important areas of safety risk in dialysis facilities. We have visited all units throughout the period of research from August 2015 to October 2016. About two-thirds of these units work in three shifts, whereas the other third work only in two shifts. The number of HD machines found in the units that work in three shifts range from ~25 to 53 machines to dialyze about 70–228 patients, whereas in the units that work in two shifts the number of machines ranges from 7 to 30 machines to dialyze about 25 to 150 patients. The number of physicians in these HD units ranges between 3 and 40. In most of these units, only one physician supervises and follows up the patients who are present per shift. The number of nurses in large units ranges from about 15 to 49, whereas in small units only two or three nurses work in these units. Five to 15 nurses were present per shift in large units, whereas only one nurse was present per shift in small units. The number of workers in the units ranges from two to eight workers. The questionnaire is divided into sections as follows: general information about the unit, cleanliness of the place, hand washing, personal protection, methods for preventing pollution, dealing with furniture and sheets, environment cleansing, dealing with waste products, occupational health, isolation, and records. We studied the entire medical team to determine the extent of their commitment to wear personal protective equipments (PPEs), commitment to wash hands etc. We also studied nurses with respect to dealing with patients and HD machines to know to what extent they follow the infection control policies. In addition, we communicated with physicians, nurses, patients, and workers in all units to be fully aware of the extent of their commitment to vaccination against HBV. Finally, we examined the records in every unit to know whether or not the data such as blood transfusion records, serological records, etc., were recorded. The units were graded as follows according to the results of the questionnaire: eight units, excellent; six units, good; and four units, poor. When most of the measures were followed in the units the results were excellent; if some of the measures were followed the results were good; and the results were poor when most of the measures were not followed. The data collected were tabulated and analyzed using SPSS (statistical package for the social science software) statistical package, version 20 (IBM Corp. Released 2011. Armonk, NY), on IBM compatible computer. 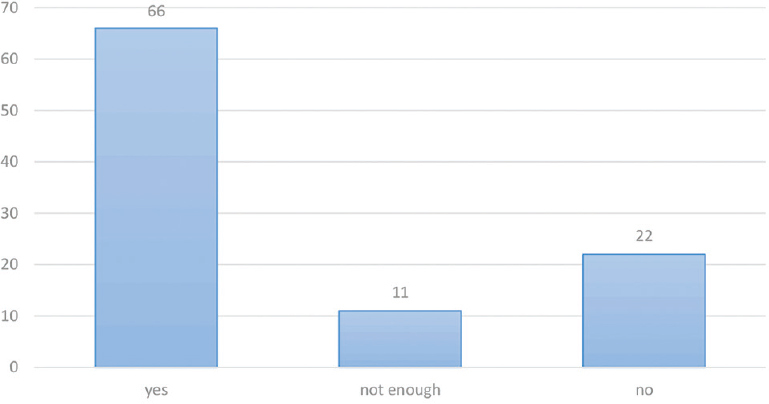 Each section of the questionnaire was presented separately on bar chart with three parameters for each variant – yes, not enough, and no – versus percentage up to 100%. As regards general cleanliness of the place [Table 1] and [Figure 1], the highest percentage (66%) of the studied units were clean in general. As regards hand washing [Table 1] and [Figure 2], soap was present in 100% of the studied units, disinfectant was present in 83.3% of the units, basins were present in 77.7%, hand dryer was present in 61.1% of the units, 55.5% of units had other hand disinfectants, and only 50% of the studied units showed commitment to wash hands or use an alternative disinfectant. As regards personal protection [Table 2] and [Figure 3], nonsterile gloves were present in 100% of the studied units and sterile gloves were present in 55.5% of units only. Plastic gowns were present in 66.6% of the units. 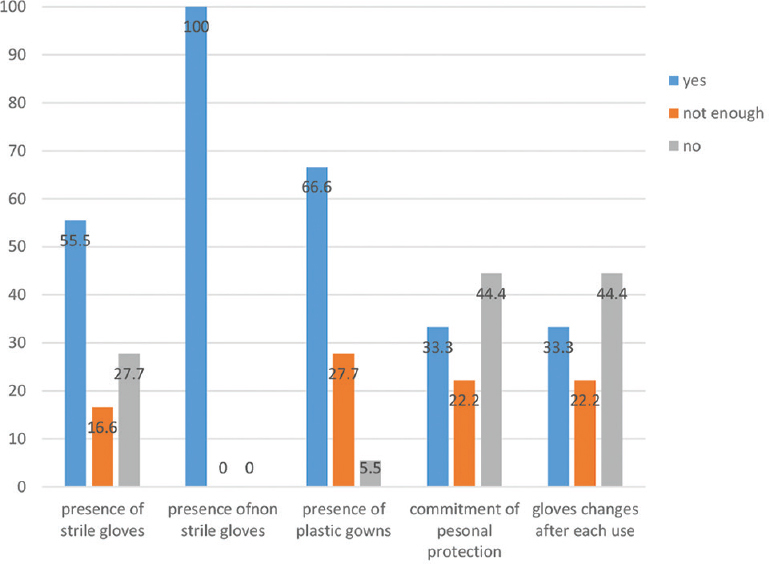 An overall 44.4% of the units did not change gloves after each use, and none (0%) of the studied units showed commitment to personal protection. As regards methods for preventing pollution [Table 3] and [Figure 4], 100% of the studied units had disinfectants. Skin disinfectant was available in 100% of the units, and only 11% of the studied units were committed to nontouch method. In 100% of studied units the solution used for the patient is the only commentator solutions holder. 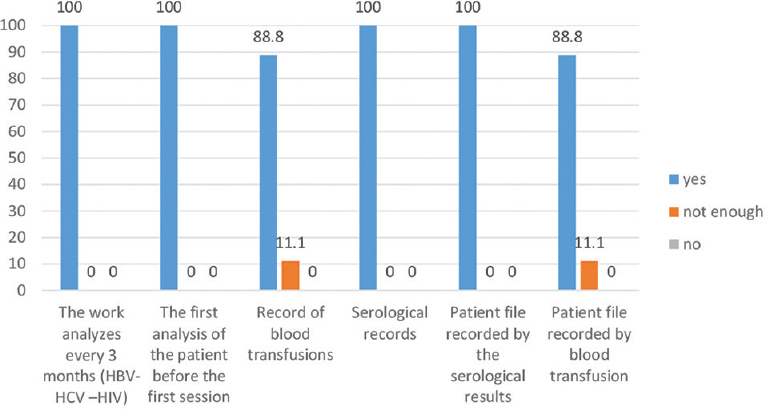 Sterile cotton sufficient for one patient was prepared in 88.8% of the studied units. An overall 88.8% of the studied units disposed unused cotton after attending to each patient. Reusable intravenous compressors were present in 52.6% of the units. None of the units had uncontaminated plastic roller; 52.6% of the studied units had no commitment to nontouch method. As regards dealing with furniture and sheets [Table 4] and [Figure 5], all units were ideal with respect to all items of it. The sheets were changed after use by each patient in 100% of the units. The sheets were sent in impermeable bags to the laundry, and clean sheets and furnishings were stored in a clean place in 83.3% of the studied units. 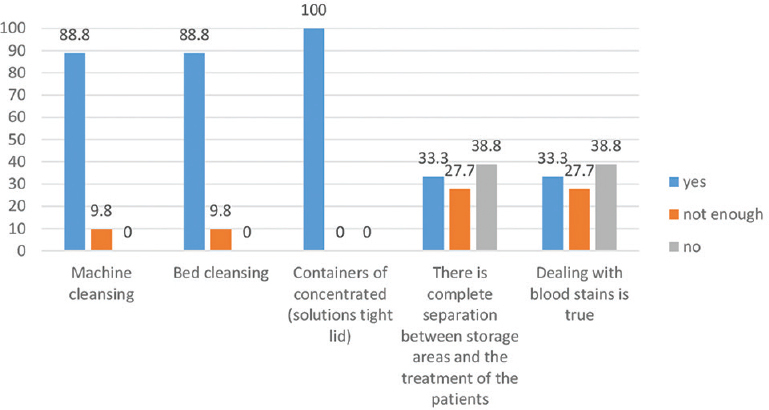 As regards environment cleansing [Table 4] and [Figure 6], in 100% of the studied units there were containers of concentrated solutions (tight lid); machines were cleaned in 88.8% of the studied units, beds were cleaned in 88.8% of the units, and 27.7% of units did not show complete separation between storage areas and the patient treatment area. An overall 38.8% of the studied units did not follow the protocol for removal of blood stains. As regards handling of waste products [Table 5] and [Figure 7], only in 66.6% of the units medical waste was separated from regular waste, and staff had commitment to the separation of waste. Collection of waste was followed according to the protocol in 72.2% of units. There were no sufficient safety boxes in 55.5% of units, and syringes placed in the safety box were not covered in 100% of studied units. As regards occupational health and isolation [Table 6] and [Figure 8], in 72.2% of the studied units, all employees had been vaccinated against HBV and the five units in which hepatitis B positive patients were present the incidence of isolation of these patients was 100%. As regards records [Table 6] and [Figure 9], all units were ideal with respect to all items used in the evaluation of records. Recording was carried out in almost 100% of the studied units. All units were graded as follows: eight units, excellent; six units, good; and four units, poor [Table 7]. All units with high number (six to eight) of workers showed excellent results in the implementation of safety measures. All units with less number (three to five) of workers showed lower results in the implementation of safety measures. The relation between the number of workers and safety measure results was found to be statistically significant [Table 8]. All units with high number (30–49) of nurses showed excellent results in preventing pollution measures. All units with less number (10–30) of nurses showed lower results in preventing pollution measures. The relation between the number of nurses and preventing pollution was found to be statistically significant [Table 9]. All units with high number (30–49) of nurses showed excellent results in safety measure implementation. All units with less number (10–30) of nurses showed lower results in safety measure implementation. The relation between the number of nurses and safety measure implementation was found to be statistically significant [Table 10]. All units with high number (30–40) of doctors showed excellent results in safety measure implementation. All units with less number (3–30) of doctors showed lower results in safety measure implementation. The relation between the number of the doctors and safety measure implementation results was found to be statistically significant [Table 11]. Figure 1: Statistics describe cleanliness of place. Figure 2: Statistics describe parameters as regards hand washing. Figure 3: Statistics describe commitment to personal protection. Figure 4: Statistics describe commitment to methods for preventing Pollution. 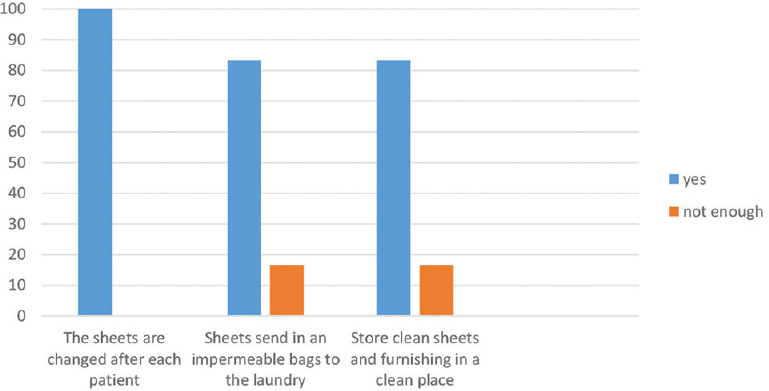 Figure 5: Statistics describe dealing with furniture and sheets. Figure 6: Statistics describe parameters as regards environmental cleansing. Figure 7: Statistics describe dealing with waste products. Figure 8: Statistics describe occupational health and isolation. Figure 9: Statistics describe record. Infection is an important cause of morbidity and mortality among patients with end-stage renal disease . After cardiovascular causes, infectious diseases are the next most common cause of death among dialysis patients. The mortality rates for dialysis patients were greatest for sepsis, followed by peritonitis, influenza, tuberculosis, and pneumonia . Standard precautions with additional measures recommended specifically for dialysis centers will prevent transmission of bacteria and viruses from patient to patient . This questionnaire was designed for the assessment of infection control measures in HD units, which is considered as one of the most important areas of safety risk in dialysis facilities. As regards the cleanliness of the place, most of the dialysis units are in a large percent clean in general. As regards hand hygiene parameters, which is generally accepted as the single most important measure in preventing the spread of infection, most of the dialysis units contain enough basins, soap, and disinfectants to wash hands and an alternative disinfectant. Despite the availability of soap, disinfectants, and their alternatives in dialysis units, there is a significant noncommitment to wash hands or use an alternative disinfectant among medical staff. PPE refers to a variety of barriers, used alone or in combination, to protect mucous membranes, airways, skin, and clothing from contact with infectious agents. As regards personal protection such as using gloves (sterile or nonsterile gloves). Sterile gloves are used before central venous catheter insertion, whereas nonsterile gloves are used before invasive procedures to the patient, such as needle insertion, before noninvasive procedure such as blood pressure measurement, and before cleaning and disinfection of dialysis machine and the surrounding environment. Sterile gloves are present in about half of the dialysis units, whereas nonsterile gloves are present in all units. This is because central venous catheter insertion maneuver, which needs sterile gloves, is not available in all dialysis units. International guidelines recommend that protective clothing (apron or gown) be worn by all healthcare workers when close contact with the patient, materials, or equipment may lead to contamination of the skin, uniforms, or other clothing with infectious agents. There is a risk for contamination with blood, body substances, secretions, or excretions (except sweat) . With regard to plastic gowns, only 5.5% of the dialysis units did not have plastic gowns, whereas the rest of units (27.7% of units) had plastic gowns, but not in sufficient numbers. Despite the availability of PPE in a large percent, there is noticeable lack of commitment to personal protection, and only 22.2% of the medical staff expressed partial (not enough) commitment to personal protection. In addition, a large number of them (44.4%) do not change gloves after each use. International guidance suggests that changing of gloves is necessary in the following situations: between episodes of care for different patients, to prevent transmission of infectious material , and during the care of a single patient, to prevent cross-contamination of body sites . Our research shows that 100% of studied units were Keeping disinfectants and disinfection after re-packaged bottles and cleanse the place to prepare treatment.skin disinfectant was available in 100% of the units. In 100% of studied units The solution used for the patient is the only commentator solutions holder, because presence of another solution may transmit a lot of infections between patients each other. Aseptic nontouch technique is the method used to reduce the risk for microbial contamination in a vulnerable body site. It aims to prevent the contamination of wounds and other susceptible sites, by ensuring that only uncontaminated equipment, referred to as key parts, or sterile fluids come into contact with susceptible or sterile body sites during clinical procedures. For this reason it should be used during any invasive procedure that bypasses the body's natural defenses (e.g., the skin or mucous membranes). For example, it should be used during procedures such as cannulation, venipuncture, administration of intravenous medication, wound care, urinary manipulation, and central and peripheral line management. As regards commitment to aseptic nontouch technique, about 66.6% of units showed no commitment to this technique, whereas 22.2% of units showed incomplete (not enough) commitment. As regards uncontaminated adhesive (plastic) roller, all adhesive rollers in the HD units were contaminated and considered a source of infection between individuals inside units. Moreover, reusable intravenous compressors were present in 33.3% of units and could cause transmission of infection from one patient to another. According to infection control policies there must be sufficient sterile cotton prepared for each patient, and any unused cotton must be disposed after attending to each patient. Sterile cotton enough for one patient was present in 88.8% of the studied units and unused sterile cotton was disposed after attending to each patient in 88.8% of the units. The study also shows that all units are ideal in all items of dealing with furniture and sheets. The sheets were changed after they were used by a patient. The sheets were sent in impermeable bags to the laundry, and clean sheets and furnishings were stored in a clean place in 88.8% of studied units. The study shows that in 100% of the studied units there were containers of concentrated solutions (tight lid). Machines were cleaned in 88.8% of the studied units and beds were cleaned in 88.8% of units. 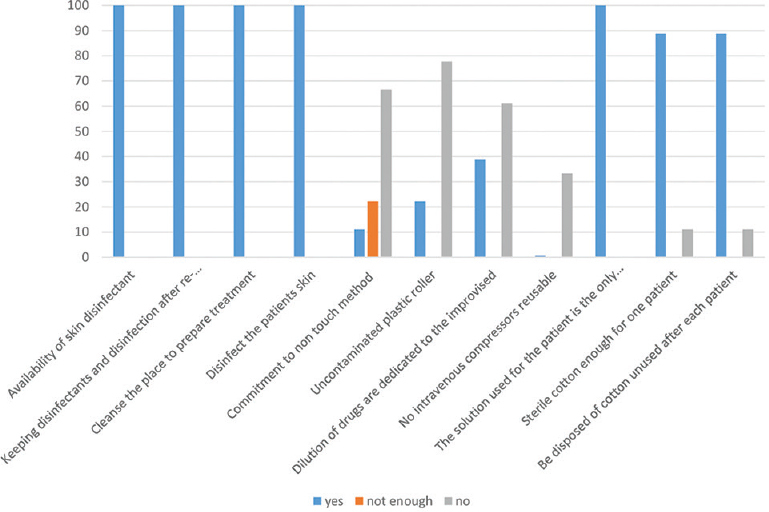 However, 27.7% of units did not show sufficient separation between storage areas and the patient treatment area. According to infection control policies the dealing with blood stains is as follows: (a) if the blood stain is large, the blood should first removed using paper towel or cloth, which are disposed off in a hazardous waste container. Thereafter, the area should be cleared with chlorine of a concentration of 5000 parts per million, and then cleaned again with chlorine of a concentration of 1000 parts per million. (b) If the blood stain is small, it should be removed with a cloth in a circular motion and then cleaned with another piece of cloth saturated with chlorine solution of a concentration of 1000 parts per million. Thereafter, the cloth is disposed off in a hazardous waste container. The study shows that 38.8% of studied units did not follow the appropriate procedure for removing blood stains. The following supplies should be available for waste separation in dialysis unit: (a) colored heavy duty bags, for disposing dangerous nonsharp medical wastes such as empty solution containers, pieces of cotton and gauze, empty blood bags, used gloves, and used syringes (without the tips); (b) black bags, for disposing ordinary wastes; these bags are placed far away from work areas and designed for disposing noninfectious ordinary wastes such as food and papers; (c) safety boxes, for disposing dangerous sharp wastes such as syringe tips (without cover), surgical needles, scalpels, etc., These bags and safety boxes must be closed after filling up to three quarters. Dangerous waste should be sent to waste treatment unit, whereas ordinary waste must be sent to regular waste collection boxes. The research shows that only 66.6% of the units separated medical waste from regular waste. In 72.2% of the units, staff showed commitment in the separation of waste and followed the protocol for collection of waste. 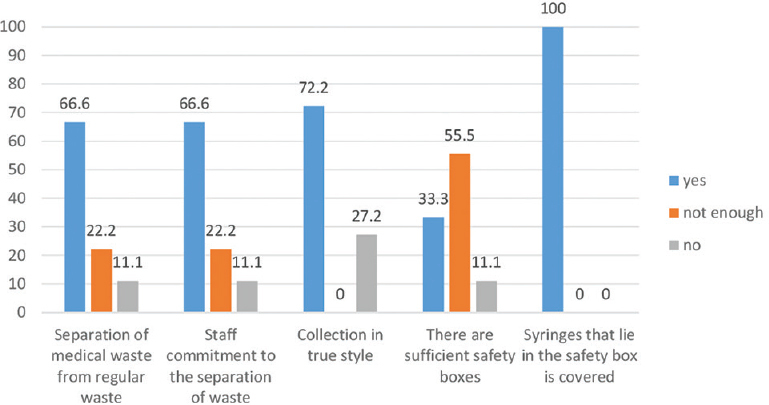 An overall 55.5% of the units did not have sufficient number of safety boxes, and syringes in the safety box were not covered in 100% of studied units. Patients on HD should be screened for HBV and hepatitis C virus infection before the initiation of HD and monitored every 3–6 months thereafter . Seropositive patients are dialyzed on dedicated machines either in an isolated area or alongside seronegative patients if space constrain does not allow isolation. Introduction of HBV vaccination, isolation of HBV-positive patients, use of dedicated dialysis machines, and regular surveillance for HBV infection dramatically reduced the spread of HBV in this setting . The research shows that in only 72.2% of the studied units, all employees had been vaccinated against HBV and the five units in which hepatitis B positive patients were present 100% isolation of these patients was followed. The research shows that all units are ideal in all items used in the evaluation of records. Almost all of them were followed in 100% of studied units. After grading for the studied units there was a significant correlation between the number of the workers, nurses, and doctors and implementation of the safety measures. In our study, we found that most of the dialysis units are in a large percent clean in general. The medical team does not commit enough to wash hands despite the availability of disinfectants. Moreover, there is no commitment in using PPEs. The studied units showed satisfactory percentage for all points as regards methods for preventing pollution except commitment of the medical team to a septic nontouch technique. All studied units were very good in all items with respect to environmental cleansing, but there was a clear error in the lack of separation between storage areas and the patient treatment area and in dealing with blood stains. We found that all studied units were ideal in dealing with furniture and sheets and in recording data, but there were a lot of mistakes in dealing with waste products. We recommend that all units should have enough staff to implement strict infection control measures to improve outcome. Kinchen KS, Sadler J, Fink N, Brookmeyer R, Klag MJ, Levey AS, et al. The timing of specialist evaluation in chronic kidney disease and mortality. Ann Intern Med 2002; 137:479–486. Kurella M, Chertow GM, Fried LF, Cummings SR, Harris T, Simonsick E, et al. Chronic kidney disease and cognitive impairment in the elderly: the health, aging, and body composition study. J Am Soc Nephrol 2005; 16:2127–2133. Desmet C, Beguin C, Swine C, Jadoul M; Université Catholique de Louvain Collaborative Group. Falls in hemodialysis patients. Prospective study of incidence, risk factors, and complications. Am J Kidney Dis 2005; 45:148–153. Patel PR, Thompson ND, Kallen AJ, Arduino MJ. Epidemiology, surveillance, and prevention of hepatitis C virus infection in hemodialysis patients. Am J Kidney Dis 2010; 56:371–378. Savey A, Simon F, Izopet J, Lepoutre A, Fabry J, Desenclos JC.A large nosocomial outbreak of hepatitis C virus infections at a hemodialysis center. Infect Control Hosp Epidemiol 2005; 26:752–760. O'Grady NP, Alexander M, Burns LA, Dellinger EP, Garland J, Heard SO, et al. Guideline for the prevention of intravascular catheter-related infections. Clin Infect Dis 2011; 52:62–93. Holley JL. A descriptive report of errors and adverse events in chronic hemodialysis units. Nephrol News Issues 2006; 29:57–58; 60–61, 63. Grabsch EA, Burrell LJ, Padiglione A, O'Keeffe JM, Ballard S, Grayson ML. Risk of environmental and health care worker contamination with vancomycin-resistant enterococci during outpatients procedures and hemodialysis. Infect Control Hosp Epidemiol 2006; 27:287–293. Arenas MD, Sánchez-Payá J, Barril G, García-Valdecasas J, Gorriz JL, Soriano A, et al.A multicentric survey of the practice of hand hygiene in hemodialysis units: Factors affecting compliance. Nephrol Dial Transplant 2005; 20:1164–1171. Sarnak MJ, Jaber BL. Mortality caused by sepsis in patients with end-stage renal disease compared with general population. Kidney Int 2000; 58:1758–1764. Wakasugi M, Kawamura K, Yamamoto S, Kazama JJ, Narita I. High mortality rate of infectious diseases in dialysis patients: a comparison with the general population in Japan. Ther Apher Dial 2012; 16:226–231. Pratt RJ, Pellowe CM, Wilson JA, Loveday HP, Harper PJ, Jones SR, et al. National evidence-based guidelines for preventing healthcare-associated infections in NHS hospitals in England. J Hosp Infect 2007; 65:51–64. Pratt RJ, Pellowe C, Loveday HP. Developing national evidence-based guidelines for preventing healthcare associated infections. phase 1: guidelines for preventing hospital-acquired infections. J Hosp Infect 2001; 47:53–82. Boyce JM, Pittet D. Guideline for hand hygiene in health-care settings: recommendations of the Healthcare Infection Control Practices Advisory Committee and the HICPAC/SHEA/APIC/IDSA Hand Hygiene Task Force. Infect Control Hosp 2002; 23:53. Alashek WA, McIntyre CW, Taal MW. Provision and quality of dialysis services in Libya. Hemodial Int 2011; 15:444–452. Fabrizi F, Poordad FF, Martin P. Hepatitis C infection and the patient with end-stage renal disease. Hepatology 2002; 36:3–10.